“Black Sails” stars Toby Stephens as the brilliant and unstoppable ‘Captain Flint.’ Stephens is an accomplished film, television and stage actor, who will appear in the feature film 13 Hours: The Secret Soldiers of Benghazi directed by Michael Bay slated for release January 15, 2016, and is well-known for his role in Die Another Day. He starred in BBC’s “Vexed” and on stage in “Noel Coward’s Private Lives,” and his many film credits include Believe and Twelfth Night. London-born Hannah New portrays ‘Eleanor Guthrie,’ a determined young woman who is now London’s most notorious convict. New starred in the miniseries, "El Tiempo Entre Costuras (The Time Between Seams)," the featureFuga De Cerebros 2, and most recently in 2014’s Maleficent. Luke Arnold portrays the classic character, ‘John Silver,’ in the years before his well-known feats. Arnold has appeared in “McLeod's Daughters,” “Rush,” and “Rescue: Special Ops,” as well as film, Broken Hill and most recently starred in the miniseries “INXS: The Michael Hutchence Story.” Jessica Parker Kennedy is in the role of ‘Max,’ a young prostitute with an eye towards advancement. Parker Kennedy is known for her work in the television series, “The Secret Circle,” and has appeared in the films 50/50 and In Time. 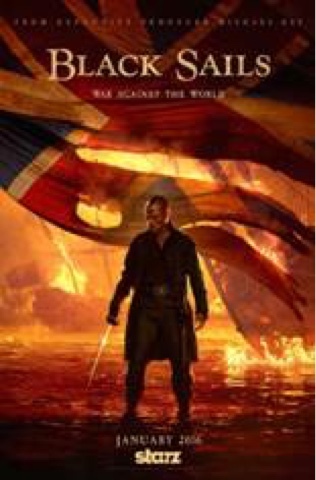 British actor Tom Hopper stars as ‘Billy Bones’ of “Treasure Island” fame. Hopper is most well-known for his role as ‘Sir Percival’ in “Merlin” and has recently appeared inNorthmen – A Viking Saga. Zach McGowan is featured as ‘Captain Charles Vane,’ a rival pirate to Captain Flint. McGowan is most well-known for his role in the series “Shameless” and appeared last year in the feature film Dracula Untold. For more information, go to the official “Black Sails”Facebook Page and follow @BlkSails_Starz on Twitter and Instagram. Join the conversation with #BlackSails and #STARZ.